With being a special education teacher… or any teacher at this point in time… we know how important it is to document every. single. thing. that happens for each of our students. While it is super time consuming, it saves us in the long run (dare I say the dreaded words due process). My students are fortunate enough to be in a school that is an inclusion school. My students receive anywhere from 30 to 60 minutes of inclusion time each school day, not including inclusion specials (like art, gym, music). 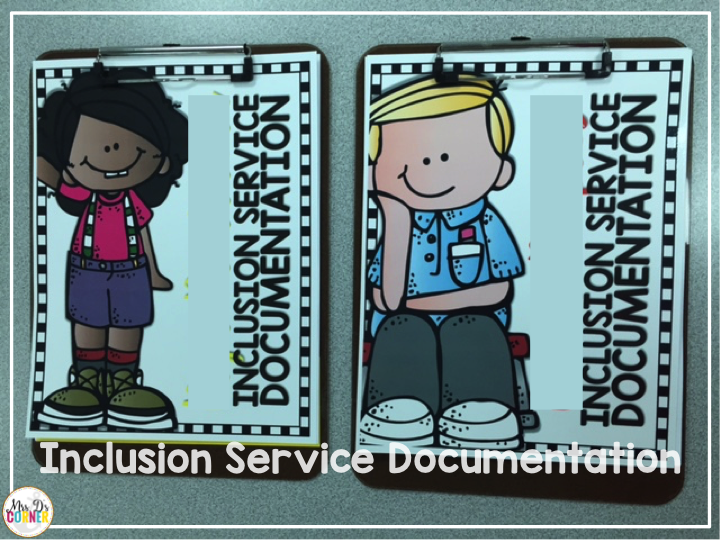 And that means us teachers and paraprofessionals need to document their inclusion service time. Every time. Every day. It wasn’t until recently, though, that we were required to have an official documentation folder for each student. So of course I took the time to dress mine up and make “official clipboards” for each of my friends. Student clipboards are color coded, that way if I need to ask a student to grab their clipboard, they have the visual color aspect as well as their name on the front. You can see more of my color coded classroom in this blog post. 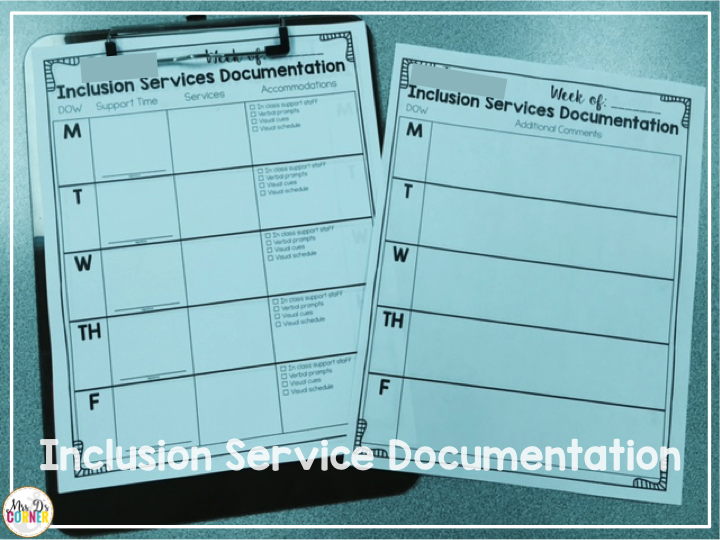 Behind each student’s cover sheet (for confidentiality), is a weekly documentation paper for inclusion services. Each student has a specific paper that directly mimics their IEP accommodations. The paper is double sided, leaving room for us to write the date, specific service times, the teacher’s name, what the lesson was about, an adult’s signature, and more… depending on your district. This helps myself, my paras, and the general ed teachers daily to remember what accommodations each student has and if we are utilizing them. And if we notice a trend that a student has not been utilizing or no longer needs a certain accommodation, we can make appropriate recommendations at their next IEP meeting. At the end of each week, we take the documentation papers and place them in their binders for safe keeping. 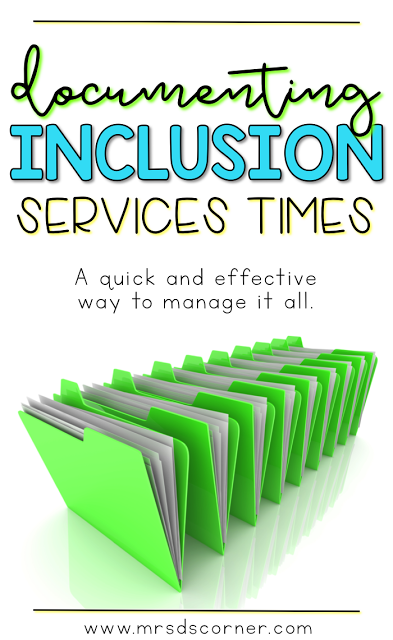 It’s a super simple system that is a quick, effective way to document inclusion service times. What are some examples of inclusion time that is not special classes? Great idea! 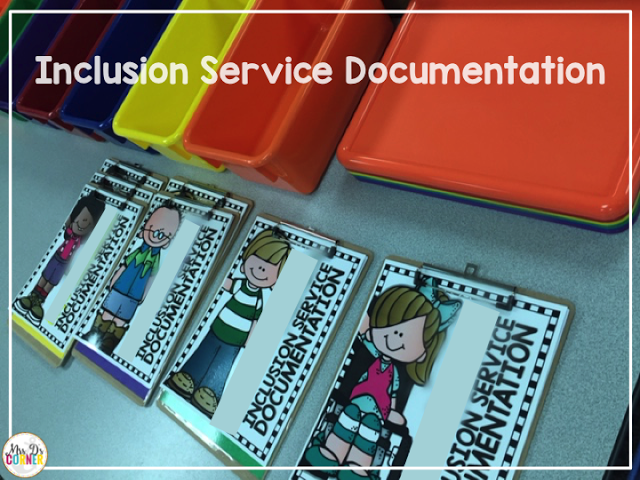 My district does not require us to document inclusion time, however I am always trying to build the portfolio of documentation just in case I ever need to (knock on wood). We start a new grading quarter next week-I plan on putting this into practice then! In your video on facebook regarding the iep caseload binder, it looked as if these inclusion documentation sheets were laminated. Do you laminate them? or do you print new ones off for each kiddo, each week so that you have a hard copy on record? Yes!! This is what I’m looking for! What do you put under “service”? What do you do with the copies at end of school year (that’s a lot of pages!) and especially all the data sheets we save. I just never knew what to do with all of them at the end of school year. Any suggestions will help! I put the exact time the student was in inclusion, who was there, and what the child learned in the class during that time. I keep all of the data sheets in a file folder. Please use a web browser to purchase and not the TPT app. 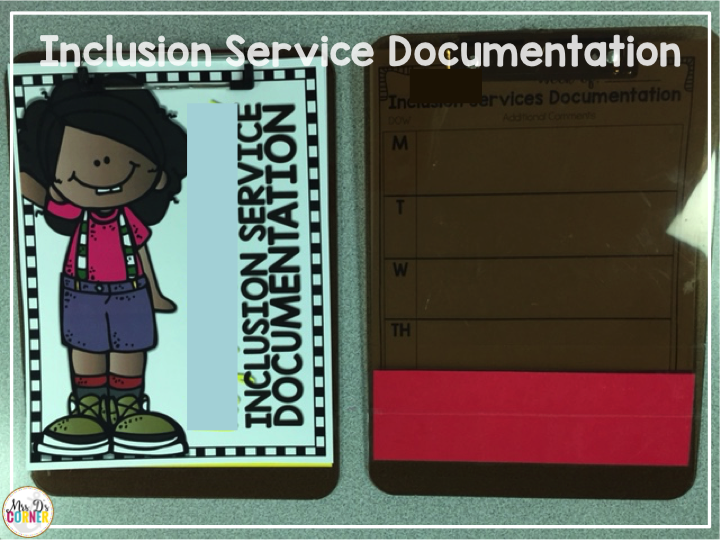 Would you ever give this or a copy of this inclusion time to a parent? I am a parent and am trying to find ways to better understand what happens during my son’s school day since he is non verbal. Yes, if it were requested by the parent I would make a copy of my original and send it home or share it with the parent.